In this film, detective Hercule Poirot has a murder to solve whilst he travels on the Orient Express train. With the culprit in a star studded seventies line up with a motive to kill for. Based on the famous Lindbergh baby kidnapping in 1932, Murder on the Orient Express (1974) is the only Agatha Christie film adaptation the famous crime authoress approved of. This one of my favourite 1970s ensemble cast movies headed by the Oscar nominated Albert Finney as Hercule Poirot, the Belgian detective. Finney is wonderfully convincing in his role until your Darlin’ Husband reminds you that his almost uncanny looks and accent resemble Kenny Everett’s 1980s character, Marcel Wave. The film is a lavish production directed by Sidney Lumet and nominated for 6 Academy Awards winning just one for the Best Supporting Actress in Ingrid Bergman. The prologue tells of the fate of toddler Daisy Armstrong who is kidnapped from her Long Island home in 1930, with a ransom demanded. This story makes headline news as events unfold. Her affluent parents and a family maid are implicated by the press in being involved with the kidnapping. The ransom is paid, yet the child is found dead. We then forward to December 1935 to Istanbul. Mary Debenham (Vanessa Redgrave) reunites with her lover, Colonel Arbuthnott (a moustached Sean Connery) on the boat taking them to join the Orient Express train. Connery has what appears to be golf clubs in a bag riffs my – now in full Connery impersonation – Darlin’ Husband. This in a second successful attempt to distract me from the movie. The movie pair are observed to kiss passionately. She is heard to say “Not now, when it’s all over, when its all behind us” by Hercule Poirot (Finney), the famed detective. The three share the boat journey across the Bosphorus. Later that Poirot has dinner with friend, Signor Bianchi (Martin Balsam), the director of the line. The men find out they will be travel companions on the famed luxurious Orient Express train, in the fully booked First Class carriage. We then cut to the station with shots of the fabulous steam train. The film then introduces us to the characters as they embark the First Class carriages. The passengers are assisted by French porter Pierre Paul Michel (Jean-Pierre Cassel). In no particular order, there’s Samuel Ratchett (Richard Widmark), a mysterious American business man, his nervy secretary, Hector McQueen (Anthony Perkins) and his competent British man-servant, Beddoes (John Gielgud). An elderly lady, Princess Natalia Dragomiroff (Wendy Hiller) and her German nurse Hildegarde Schmidt (Rachel Roberts). There’s also a young glamorous Hungarian married couple, the Count Rudolf and Countess Elena Andrenyi (Michael York and Jackie Bisset). We then meet Lauren Bacall’s brassy, twice widowed American Mallory Archer Harriet Hubbard (Lauren Bacall) and a timid, nervous and a religious, Swedish woman, Greta Ohlsson (Bergman). And of course, the lovers, Arbuthnott and Debenham. And a few more. Poirot finds he is sharing a cabin with McQueen. The next day Bianchi moves to another carriage allowing Poirot a single carriage. Ratchett approaches Poirot saying he has received a number of life threatening notes both before and since boarding the train. Revealing he sleeps with a loaded gun underneath his pillow due to these. He seeks Poirot’s assistance to find out the author behind these notes, but Poirot turns the offer down. Poirot has a sleepless night with an interrupted sleep. Ratchett is heard to be reassured after a nightmare by a porter. Poirot observes a mysterious woman in a white dressing gown with a dragon walking up the carriage. Mallory Hubbard complains of a man entering her room. The next morning Ratchett is found murdered. This after being stabbed 12 times with varying strengths of blows used to kill him. Other evidence includes a burnt letter, a pipe cleaner, cigar, a woman’s lacy handkerchief with H embroidered on it and two matches. A broken pocket watch is found in Ratchett’s pocket, suggesting the murder took place at 1.15 am. The train was stranded a snowdrift before then and there are no fresh footprints in the snow. Therefore it is indicated the murderer is within the first class passengers as no-one entered or left the train after this. So with the help of Bianchi and a doctor, Dr. Constantine, Poirot interrogates the suspects During an interview with McQueen, Mallory Hubbard enters stating she’s found a button similar to those found on the porter’s uniform. It also transpires – through further examination of the letter remains using a hat box – that Ratchett had Mafia connections. Also Ratchett was formerly known as Cassetti, the leader of the two men who kidnapped the Armstrong child. However he had escaped justice with the ransom money. Further tragic details of the Armstrong story are revealed. And we watch Poirot question the First Class passengers we learn more of their characters, additional facts are learnt about the suspects and (often conflicting) evidence is discovered. Off screen our suspicions are raised and the passengers motives debated. Through using his “little grey cells”, Poirot speculates more on the suspects and their ties with the victim. This leading to the unveiling of the truth.. The film evokes the 1930s ambience with the opening dramatic theme score accompanied by credits in an Art Deco font. This thirties theme added to with the prologue in an old-fashioned montage. This using black and white and sepia footage newspaper headlines and photographs telling of the background to this intriguing crime story. The train itself and the props – such as the luxurious decor, furnishings and food within the station – were lovingly recreated in tremendous detail. These providing a fascinating film noir movie echoed with billowing steam as we are introduced to the cast. The wonderful costumes worn by the stars, exude 1930 glamour for Bisset, York, Hiller and Bacall. All looking every inch the aristocrat. The others in their servant roles or more informal attire with character appropriate 1930s design. This reminding me of other films set in this era such as The Postman Always Rings Twice (1981) and Paper Moon (1973). The costumes rightly won an Oscar nomination for their fine recreation to detail. However, they did seem to have raided the entire international dress department for this era in the station scene. The luminaries costumes however along with the shots of the train provided film memories on an old-fashioned whodunnit. On watching a documentary on the movie, Lumet tells of how the celebrated cast came together after he recruited Sean Connery. With actor, Richard Widmark admitting to signing up to meet his co-stars alone. Although their spoken parts are small, at times they often seem to be merely seen but not heard. But for this reason, the actors stay within their character throughout all their scenes. This making the background as interesting as its foreground, especially during Poirot’s final monologue. It was wonderful to see the likes of two Bogart ladies, Bergman and Bacall sharing a movie moment. Or characters almost eerily setting themselves up for future parts with Gielgud as a butler. And reflecting on old ones with Perkins almost sending up his Psycho (1960) character, in ways he speaks about his mother. Lumet was reported to particularly happy to have Bergman involved in the movie, saying she wanted to play the role she acts in rather than the suggested more visible role of Princess Natalia Dragomiroff. Joking he would have let her play Poirot if she had suggested it. Michael York speaks of how surreal he felt being made more elegant in his character, while more established leading ladies like Bergman were made more dowdy. The make up particularly for Finney was amazing, where the much younger Finney was aged 20 years for his part. Hiller looked like a ghostly character and her servant Schmidt almost ghoulish. However Darlin’ Husband felt more attention to the hair of 1970s looking waiters in the initial scenes, which detracted from the period. Finney as Poirot to almost startling effect. He played a wonderful and believable much older detective, deservedly getting a Best Actor nod at the Oscars. His depiction was also praised by the author Christie and his acting peers as he took on the accent, mannerisms and look of the Belgian detective. This almost fooled Bisset into believing he was a different person, having not seen him out of costume. Poirot’s monologue where in the final denouement where he revealed all was as always the highlight of these Christie film adaptations. In this Finney excelled. With the help of flashbacks, he recreated how he believed the night of the murder enfolded. This in a scene of reportedly eight pages of dialogue. Leaving you breathless and in suspense as he examines the evidence and suspects’ motives. To conclude, with the First Class script and a fantastically famous cast onboard, you’ll be transported back to the 1930s for this distinguished vehicle. It really would be murder not to watch it. 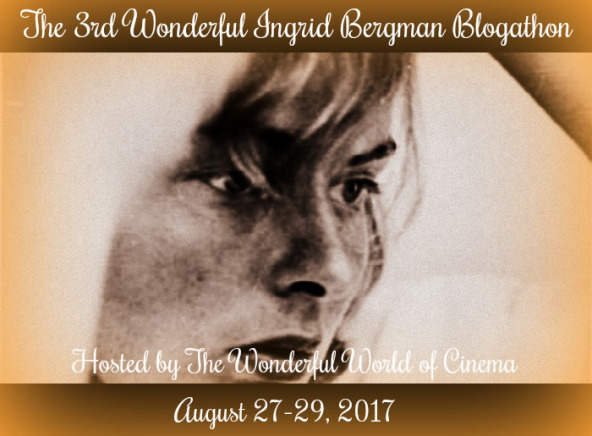 This review was added to the 3rd Wonderful Ingrid Bergman Blogathon held by The Wonderful World of Cinema. Other films reviewed here with this cast include Richard Widmark in The Swarm and Jacqueline Bisset in Class. Sean Connery stars in Outland and Family Business (also directed by Lumet). Now this is what I call an all-star movie. Hmm, you might have stumbled on to something there. Albert Finney? Jacqueline Bisset? Michael York? Murder on the Orient Express was the first Agatha Christie book I ever read, and it left me speechless. It was a really clever work. When I watched the film, the big surprise was ruined for me, but I still enjoyed the cosrtumes, settings and Finney as Poirot. I was the opposite from you, watched the film and then read the book. And then got hooked on her Poirot books. Bergman and Bacall together! Why have I never seen this? You’ll love it, Bacall is fantastic. Great review! I gree the cast of this film is just great! 🙂 Apart from Ingrid, I think my favourite performance is the one by John Gielgud. I love this actor!!! Thanks for having me x Was great to see this movie again.